The Ghost In the Shell geishas have been spoken about as one of the high points of the film’s trailer. If you’re curious about how they made those terrifying robots, Adam Savage (Mythbusters) has a video for you. On his show Tested, he heads down to Wellington, New Zealand to chat with Sir Richard Taylor, CEO and co-founder of Weta Workshop. He got a behind-the-scenes look at the incredible amount of work that went into these characters. RELATED: Weta Ghost In the Shell Collectibles are Here! Taylor showed Savage some of the masks that were made of the Ghost in the Shell geishas and talked about why they didn’t go with makeup or prosthetics. He explained that either of those options showed too many imperfections in the skin. The masks were molded from actress Rila Fukushima‘s face and then customized to fit on the actresses playing the roles. He showed the insides of the mask, talking about how he tried to make it simple to get on and off, as well as making it comfortable, and easier for them to perform in. We get a look at the clockwork inside the mask, as well as at the elaborately-designed ribs inside one of the bodies. Taylor explained that the team (which consisted of between 120-150 people during production) created the look based on “clock makers of the 17th century” and mentioned the film Hugo as an influence. 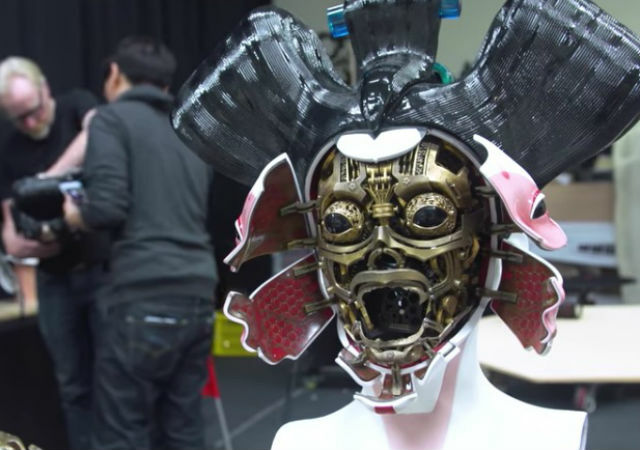 He also explained the look by saying that it’s “a technological mix between hand-crafted, beautiful, skill-based work… maybe the Asian eye-maker from Blade Runner is a great example of that.” Check out the video below for an in-depth look at the craftsmanship that went into the Ghost in the Shell geishas. Ghost In the Shell will hit theaters on March 31, 2017. The film stars Scarlett Johansson, Michael Pitt, Takeshi Kitano, Juliette Binoche, Pilou Asbæk, Kaori Momoi, Chin Han, Danusia Samal, Yutaka Izumihara, Tuwanda Manyimo and Rila Fukushima. Are you guys excited to see the film? What do you think of the Ghost in the Shell geishas? Let us know in the comments or tweet us @comingsoonnet.